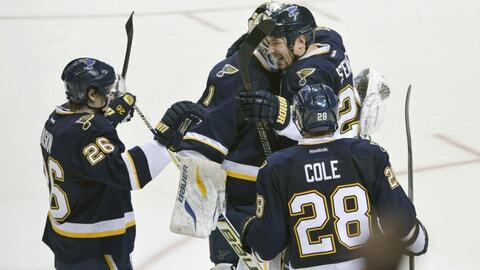 After scoring twice late in regulation to tie the game, the Blues celebrated their third win of the season over the Chicago Blackhawks. ST. LOUIS Even with leading scorer Alexander Steen watching from the press box, the St. Louis Blues had plenty of offense. Vladimir Tarasenko and Patrik Berglund scored 1:17 apart late in regulation to tie it and defenseman Kevin Shattenkirk netted the deciding goal in the fifth round of a shootout in a 6-5 victory over the Chicago Blackhawks on Saturday night. "We sure do miss some great and important players, but we still have to get points, win games," said Berglund, who beat rookie goalie Antti Raanta on a power play with 2:34 to go. "Obviously, a good start for that is to come back against this team and in this building." Shattenkirk had an assist for his 27th point and scored his second game-deciding shootout goal against the Blackhawks. Last season, he scored in the seventh round of a 4-3 victory on April 4 in Chicago. "They have a little more faith in me," Shattenkirk joked. "It’s nice when you get out there and you have a chance to win it for your team." Patrick Kane had a goal and assist in the Blackhawks’ second three-goal first period in two nights and extended his point streak to 14 games. Kane added another assist on Brent Seabrook’s goal in the third period that made it 5-3 – Chicago’s third two-goal lead. "They couldn’t handle us in their zone, and we couldn’t handle them in our zone," Blues coach Ken Hitchcock said. "So it just goes back and forth. I was happiest that we stayed with it." The Blues are 3-0 against the Blackhawks, who lead the NHL with 60 points. Two wins were by shootout and all three were decided by a goal. St. Louis faced deficits of 2-0, 3-1 and 5-3 without Steen, who was placed on the injured list on Saturday because of a concussion. Steen, who is second in the NHL with 24 goals, is out indefinitely. "The crowd was into it, great intensity," Blackhawks coach Joel Quenneville said. "Good for the sport. Tough for us." Brian Elliott finished strong in the Blues’ net after Jaroslav Halak was pulled following a rough first period. "We were discouraged and so I just felt like we needed to do something to kick us into a different gear," Hitchcock said. "Sometimes those things work and sometimes they don’t." Kane has eight goals and 17 assists during his point streak. Patrick Sharp scored his 22nd goal in the first period and has six goals in three games. T.J. Oshie and Tarasenko also scored in the shootout for St. Louis. Jonathan Toews and Sharp scored for Chicago, which failed on chances by Marian Hossa and Kane to end it. Kane, who shot wide, is 0-for-9 in the shootout. "We knew they weren’t going to quit," Kane said. "Of course it’s frustrating. We got a point, so I guess that’s one positive you can take from it." The Blackhawks faded one night after they beat Colorado 7-2 at home, and fell to 7-0-3 on the second day of back-to-back games. Berglund’s tying goal came with Niklas Hjalmarsson off for holding. Kane, Toews and Duncan Keith had two points apiece in the first period for Chicago. Seabrook’s floating shot from near the blue line 1:06 into the third gave the Blackhawks a 5-3 lead. Elliott replaced Halak, who stopped only 10 of 13 shots in the first period. The Blues tied it at 3 on rookie Dmitrij Jaskin’s first NHL goal in the second period. "It was a lucky shot," Jaskin said. "I was just excited, really excited." NOTES: The Blues had their first home sellout of the season with a standing-room crowd of 20,082. Attendance was fortified by several hundred fans wearing Blackhawks red. … St. Louis is 11-0-1 against the Central Division. … Blues F Vladimir Sobotka aggravated an upper-body injury at the end of the morning skate and wasn’t activated from the injured list, as had been anticipated. Derek Roy was scratched due to flu-like symptoms. … Before Saturday, Raanta had allowed two or fewer goals in 12 of his 13 games.